My blog turns the grand old age of 3 years old this month! I started it as a very temporary way to pass the time and keep my brain alive whilst I was on maternity leave. As much fun as reflux and sleep deprivation was at the time I found myself wandering around in a permanent zombie like state and being constantly grumpy at absolutely everything. This blog gave me a much needed positive outlook on becoming a brand new mum and recording all the little big important moments in Little Zs life. It was only going to be for a year, whilst I was on maternity leave; hence the blog name. But by the time I went back to work I was way too addicted and I really enjoyed writing about him. So here we are 3 years later and I’m still enjoying it. I’ve been reminiscing about the last year and looking back at things I’ve completelt forgotten about. It’s the year I finally took the plunge and bought myself a Nikon DSLR and I really love it, even though I don’t use it as much as I should. Visiting Lyme Park with it was one of my first attempts to take better photos. We visited Turkey in June and I captured a lot of memories of Side in Anatalya. We’re visiting again soon and I can’t wait to see it all again. Little Z continued to entertain us through the not so terrible twos and I wonder sometimes if he might be making up for a bit now. Its funny to look back at his favourite things at a particular point in time and he always looks so young. The “But Why” phase was particularly challenging though and it has thankfully calmed down a tiny bit. We had lots of fun days out in the sun, including meeting Fernando one sunny day and having an amazing trip to Malaysia in November. I contemplated whether I was content and decided I probably wasn’t but that there was nothing wrong with that. There was still a lot I wanted to do back then and nothing has changed now. We started the new year going potty with potty training. It felt like a very very long process but he cracked it. And whilst some days it actually feels like he’s happily un-training himself he is mostly there or there about. There are a lot of days I have to repeat “no peeing in your pants today” even now. I did happily dream about a trip around the world during that whole time though. I’m not sure what direction this blog will go in in years to come but I’d like to think it might be filled with humorous anecdotes, beautiful photography and more accounts or dreams of travelling the world! 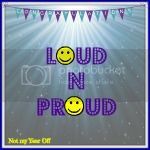 If you’d like to link up to Loud n Proud this week then I am your friendly host and the linky will be going live on Thursday 7am. Simply grab the badge for your post and link up below. It can be old, new, small, big, and about anything you like. This entry was posted in Toddler and tagged 3 years of blogging, blogging, blogging for fun, blogs, mum blog, Parenting. Bookmark the permalink. Glad you enjoyed Malaysia – my family are originally from there but I’ve never been to Langkawi. Looks lovely. I look forward to the day when our kids are old enough to let us go on long-haul trips like that again! Yay three years!! My blog will bet heretics year too. I love your blog so I would just keep on doing what you’re doing. Congratulations on three years, you are a few weeks ahead of me, although I always totally miss the actual date! Happy birthday blog! I love your blog – even though Z is so much younger than my kids, I always enjoy reading it. I’m fast heading towards three years too. It is so addictive and such a fantastic outlet. “I contemplated whether I was content and decided I probably wasn’t but that there was nothing wrong with that.” That struck such a chord as I feel like that but hadn’t got round to reconciling and accepting it. Thank you for making me realise that I can. Great blog – look forward to another 3 years … at least! Happy third blog birthday! That is an amazing achievement! You must be so proud and it’s so lovely you have such a great record of little Z’s life from tiny baby to now. If I reach one year I’ll be pretty chuffed so I’m very impressed you’ve reached this landmark. Lovely post. Jess Paterson recently posted…What To Say At BritMums Live? happy birthday! The linky doesn’t appear to be working but here is my post! Happy Blog Birthday. I love how our blogs change with us through life. It’s the life journey, keeps things interesting ;0). I hope your goals/dreams come true and you will get to travel and we get to read about it. Happy Birthday to Not My Year Off. I knew we’d been blogging a similar length of time. Only about a month apart. I look forward to reading your blog for years to come and hearing about the funny things Z has come out with and looking at your lovely photographs.